Over the past six months or so I’ve been doing a lot of casual testing of the various mobile GIS platforms available on the market today. Right now is an ideal time to discuss the offerings because just in the past week we’ve had an update to a key application in this arena (Collector for ArcGIS), we are on the verge of having an interesting new hardware player enter the market (Garmin’s soon to be released Monterra handheld GPS) and several vendors are dropping serious hints about where they see their products headed in 2014. 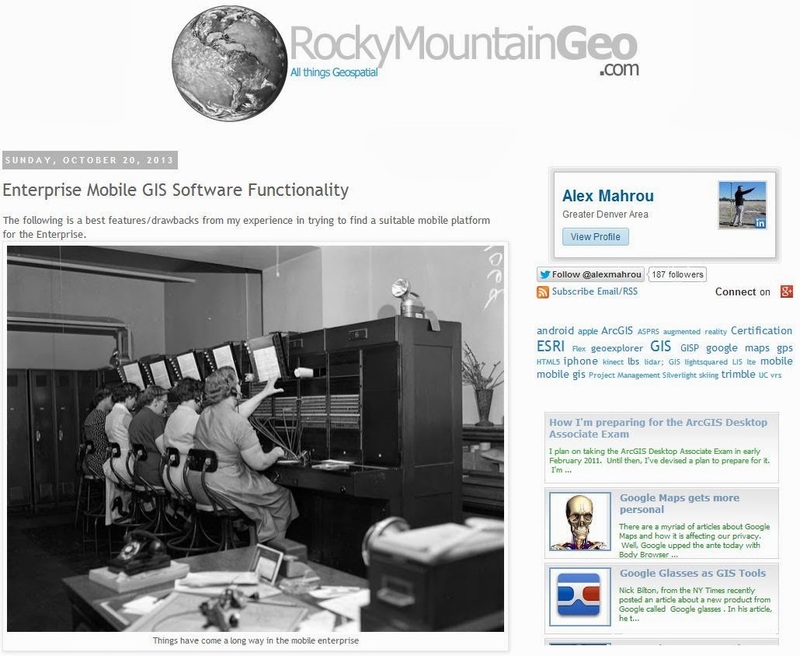 I was ramping up to do a lengthy blog post on this when I dropped by Alex Mahrou’s always interesting RockyMountainGeo GIS blog and was surprised to see he had already done all my work for me. Back in October Alex did a great overview of the current offerings in a posting titled Enterprise Mobile GIS Software Functionality. All I can do is add minor updates to some of his information and add a few of my own observations. I like the switchboard analogy! The single biggest update is the newest version of Collector for ArcGIS (version 10.2) that was released last week for the iOS and Android platforms. This version addresses one of the two biggest complaints about earlier versions of Collector – polyline and polygon data collection. It also offers an improved user interface and well thought out workflows. While the Android version still has some rough edges, the iOS version is a polished, smoothly functioning app that reflects ESRI’s mature experience in developing for Apple’s mobile operating system. It is a very good app. Where ESRI seems to be unnecessarily holding back is off-line data collection and editing, and data synchronization. As Alex notes, ESRI informally promised that this feature would ‘absolutely, positively’ be incorporated into Collector before the end of 2013. It now looks like we’ll have to wait until sometime in early 2014, when ESRI plans for a significant overall upgrade to Collector, perhaps better positioning it within their enterprise software offerings. In my opinion ESRI missed the ball on this one. Incorporating off-line data storage and editing in the iOS and Android operating systems isn’t hard to do; Trimble had it available almost six months ago in their initial release of TerraFlex. I understand there are other issues at play here – background map data caching and the incorporation of operational layers (both something Trimble’s offering lacks), but ESRI still could have incorporated basic off-line functionality in this new release and just built on it for the upcoming major release. Trimble’s TerraFlex is an app I tested back in June and was initially very impressed. Where most of ESRI’s mobile offerings (Collector, ArcGIS App, ArcGIS for Windows Mobile) require some expensive back-end infrastructure – ArcGIS Online, Portal or ArcGIS for Server – TerraFlex offers a far simpler mobile solution paradigm. Everything is cloud based and single fee. You pay your money and you get everything TerraFlex has to offer, and all for a relatively paltry price as compared to ESRI’s mobile solutions in the same marketplace. Of course, this easier to use solution comes at a cost (pun intended) – what the initial release of TerraFlex didn’t offer was pretty extensive; no background map caching, no data editing either on the device or in the desktop interface, no operational layers, and some very limited data export options. On the other hand, what TerraFlex does offer is pretty impressive given the price: off line data storage and sync, mature and stable apps not just on the iOS and Android platforms, but Trimble also had an app available for the Windows Embedded Handheld OS right out of the gate. Trimble wasn’t about to leave out the thousands of Trimble customers running their Juno handhelds who are still stuck with a dying Windows OS. Kudos to Trimble on this. Trimble indicates many of these shortcomings will be addressed in 2014, and Trimble seems poised to leverage what they do best – allow TerraFlex to incorporate high precision GNSS positions (including RTK-based solutions) into the data collection stream. This could turn TerraFlex from a mere mapping grade data collector into a serious high precision data collection tool. In his blog post Alex discusses Fulcrum. To be honest, this is an application I’ve known about but have not had a chance to test. Looks like I’ll have to take it for a spin sometime soon. So as 2013 draws to a close where are we at with mobile GIS solutions? The best analogy I can think of is that of a ballplayer with a lot of potential who’s just been called up to the majors. His batting stats are getting better with each game, but he still has problems connecting with the ball. The potential is there, he just needs more time. So it is with mobile GIS apps. Most are still somewhat of a ‘swing and a miss’, but they are getting close to smacking the ball out of the park. Whether it’s off-line data collection with ESRI’s offerings or TerraFlex’s incorporation of cached maps, in-app editing or incorporation of high precision position feeds, 2014 is starting to look like the field will really mature and we’ll get closer to the full promise of mobile GIS. It’ll be an interesting year! This entry was posted in gis, Technical, Tools and tagged mobile by Brian Haren. Bookmark the permalink.